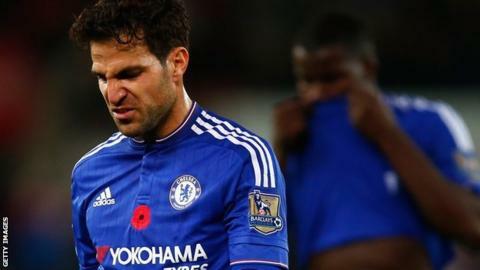 Midfielder Cesc Fabregas used a strong expletive to describe Chelsea's season to date and said he cannot understand what is going wrong. The defending Premier League champions have lost seven of their 12 league matches and are only three points above the relegation places. He added: "When things are going your way, you flick the ball with your heel and it flies into the top corner, whereas now every piledriver is going off target. "Either way, we need to get back to winning ways sooner rather than later." The Spain international was one of a number of players Blues manager Jose Mourinho said had underperformed this season. Two weeks ago, Fabregas denied media allegations he had organised a dressing-room revolt against Mourinho, saying he was "extremely happy at Chelsea" and had an "excellent relationship with the manager". The former Barcelona midfielder told Marca he and Mourinho still trusted each other. "Things with Mou are good," Fabregas added. "Obviously when you're not winning things always get said, whereas when you're winning everything's rosy. "But all of us - the players, fans and the coach - have to pull together and hang tough. "We're the only ones who can turn things round. Nobody is going to give us a helping hand. We're still in a position to challenge the big boys in the Champions League, but in the Premier League we need to get our act together right away."